Jesus typically saves, but when you're talking NY Yankees baseball, where win now and always is the company mission statement, Jesus is the one who needs saving. As the Yankes approach the start of Spring Training, the stories will be about what is missing from the team. Cliff Lee, Andy Pettitte, a reasonable option for the 3rd slot in their rotation. Jesus Montero, the Yankees 21 year old catching prospect from Venezuela, is opening camp with a legit shot at the backup job (if you believe that Russell Martin is assured the starting gig). At this point, fans know Montero because he has been the rumored chip in many potential trades over the last couple of years that haven't happened. 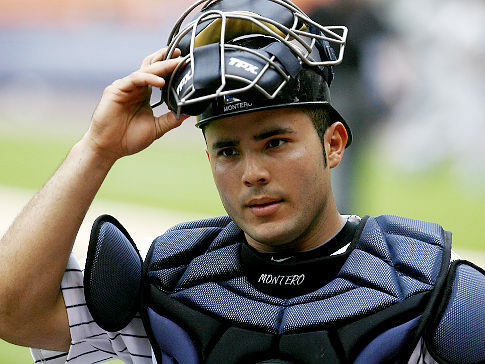 What Yankees fans should focus on is Montero's potential. Baseball America ranked Montero the 4th best prospect in baseball in 2010 behind Jason Heyward, Stephen Strasburg and Mike Stanton. You may have heard of those guys. Ranked behind him? Brian Matusz (5), Desmond Jennings (6), Buster Posey (7) and Neftali Feliz (10). All of whom have made an impact in the majors. Buster Posey caught the World Champions last year! The major difference in Montero and the rest of those guys? They didn't have Jorge Posada entrenched ahead of them. There's no coincidence that Brian Cashman, Yankees GM, immediately addressed Posada after the completion of last season and made him the full-time DH, opening the catcher spot. The knock on Montero is that he may not be a good enough defensive catcher to play the position in the majors, and some believe his natural position will be DH. So what? Nobody is afraid he won't hit. This is a guy who is projected to be an above average power hitter who will hit for average. When was the last time the Yankees had a legit bopper, a 3-4 hitter, come through their system? Don Mattingly? Bernie Williams hit 4th for World Series champions but was never the prototypical 3-4 hitter. Even if you wanted to count him, we're talking 20 years! Assuming the worst and Montero can't catch then we have Edgar Martinez or David Ortiz on our hands. At best, we may have Mike Piazza or Jorge Posada II - catching 10 years hitting .320 with 35-40. You can't trade this guy! Save Jesus! I think most Yankees fans would agree. Unless Felix Hernandez becomes available.